The New York Islanders didn’t make a big splash at the trade deadline yesterday, but it may still feel like it to the dressing room. Today the team officially activated Andrew Ladd and Thomas Hickey from injured reserve and both are expected to be in the lineup tonight against the Calgary Flames. Ladd hasn’t played in a game since November 13th but was actually off to an excellent start under new head coach Barry Trotz. After two seasons of struggles in New York, Ladd had seven points in his first 14 games while playing a reduced role and will hopefully bring some of that success back to the ice tonight. 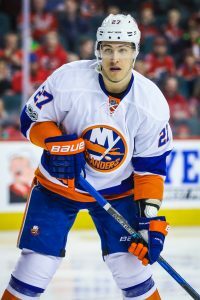 The veteran forward is regarded well for his leadership qualities and defensive acumen, but will need more than just that to help the Islanders run the table and hold onto first place in the Metropolitan Division. While Ladd may be the more notable name, Hickey certainly brings more impact. The 30-year old is a reliable two-way defenseman that can play in almost any situation for the Islanders and has been out more than two months with an upper-body injury. He’d been averaging the most ice time of his career under Trotz, and could very well work his way into the top group of defensemen once again. Both players will feel like deadline additions given their long absences, and the team is relying on them to be competitive assets to them down the stretch and into the future. In fact, both Ladd and Hickey are signed long-term and will be a part of this team as they continue to grow. Ladd is under contract through 2022-23 at a cap hit of $5.5MM, while Hickey will earn an average of $2.5MM per season through 2021-22. The New York Islanders made a handful of moves this morning, first sending Michael Dal Colle back to the minor leagues. The team has also recalled Andrew Ladd and Thomas Hickey from their respective conditioning stints, though neither have actually been activated from injured reserve yet. Dal Colle was one of the Islanders only waiver-exempt forwards, but his assignment still only leaves them with a single free roster spot. The team will have to make another move to open room in order to activate both Ladd and Hickey. Dal Colle, 22, has played 20 games with the Islanders this season, his first taste of anything close to regular action since being drafted. The fifth-overall pick from 2014 seems to have turned a corner in his development and is a much more polished player overall. In the AHL where he has played 29 games, he has recorded 16 goals and 28 points. For now he’ll return to a line with Josh Ho-Sang and Tanner Fritz, but it won’t be much of a surprise to see him back up with the Islanders before long. Meanwhile, the return of Hickey especially will be a big one for the Islanders. The 30-year old defenseman hasn’t played since December 17th but is normally a huge part of the team’s blue line. A solid two-way player, Hickey drives possession numbers and will feel like a big trade deadline acquisition whenever he gets back into the lineup. Ladd has been out even longer, but after a pair of underwhelming seasons in New York it’s unclear what he’ll bring to the table for the team. At the very least, the 33-year old forward is an exceptional leader and has experience in several different roles. The New York Islanders have sent Tanner Fritz to the AHL to make room for the soon returning Andrew Ladd. Fritz had played in two of the Islanders first three games and even recorded an assist, but will be heading back to a more comfortable role in the minor leagues. The 27-year old forward has played just 36 games in his NHL career, but is nearly a point-per-game player in the AHL. Tristan Jarry has been officially recalled by the Pittsburgh Penguins to serve as backup tonight, taking the roster spot of Derek Grant for the time being. Grant cleared waivers today and has been assigned to the Wilkes-Barre/Scranton Penguins of the AHL. Jarry won’t start, but could get some work with Matt Murray out with a concussion—though the latter was already skating with the team today. The Calgary Flames have sent Matt Taormina to the minor leagues after clearing waivers, where he’ll take residence in his usual offensive defenseman role. The 31-year old is coming off back to back seasons with at least 52 points in the minor leagues, and should find similar success again this year. Tomas Hyka is on his way up to the Vegas Golden Knights, who moved Paul Stastny to injured reserve yesterday. The Golden Knights are not off to quite the same start as a year ago, but might be able to coax some offensive production out of the 25-year old Hyka. Signed last year out of the Czech league, Hyka was nearly a point-per-game player at the AHL level and even contributed three in his short stint with the Golden Knights.